No, it's not Christmas yet - but it's never too early for Christmas cards is it? For this week's edition of Simply Stampin' Up! 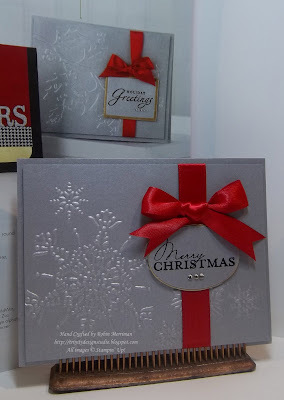 I've recreated a gorgeous, contemporary Christmas card that I saw in a paper crafting magazine. When I saw this photo in the magazine, I knew right away that this would be a cinch to recreate using all quality Stampin' Up! product. Let's get started, ok? Layer 1 - Card base - Brushed Silver cardstock cut at 5 1/2" x 8 1/2" folded to make a 4 1/4" x 5 1/2" card. Greeting - I used a scrap of Brushed Silver cardstock and stamped the greeting from Contempo Christmas with Basic Black Craft Ink. 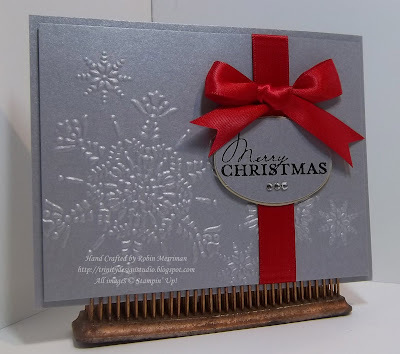 I then heat embossed it with Black Embossing Powder and my Heat Tool. It was punched out with the Extra-Large Oval Punch. To get the layer for the greeting, I used a scrap of Brushed Gold cardstock and my Ovals Die for the Big Shot. The smallest oval will give you the tiniest border around the Extra-Large Oval Punch shape, which is just what I wanted for this card. The layers were adhered together with SNAIL and I added three small Rhinestone Jewels under the greeting. **TD Tip - The package of Rhinestone Jewels comes with three connected lines of rhinestones. When I want a row of rhinestones, I use my Paper Snips to cut the lines apart between the number of jewels I need. Here I used three. It's so much easier to line them up when they are connected like that! Assembly - I decided to pop up the whole top layer so I used the edge pieces of my Stampin' Dimensionals sheets in the four corners. NEVER throw those away! They work just as well as the 300 dimensionals you get in the package and are PERFECT for small punches and whole edges like on this card. Before I adhered my top layer to the base card, I wrapped a 5 1/2" piece of Real Red Satin Ribbon around the right side of the card and secured it with SNAIL on the back. The bow was tied with an 11" length of more satin ribbon and adhered with Mini Glue Dots just above the greeting which was adhered with two Stampin' Dimensionals. And folks, that's it! Simple, elegant, lovely. In fact I loved it so much that I used up all of my Brushed Silver cardstock and made about 25 of these for Convention swaps! LOL! So, if you want to recreate this card, you have two options. 1 - you can place an order for the supplies you need right from my ONLINE STORE. I've included a handy supply list for you below. OR 2 - you can come to my WOW! Christmas Cards class in October - I do two of these each year - and you'll get to make two of these cards along with 8 other drop-dead gorgeous projects! Keep a check on my class listings for the dates and times! In the meantime, I'm off for more Convention fun! Have a great day stampers!